Home > On the Golf Course > Is PowerPlay a winning formula? 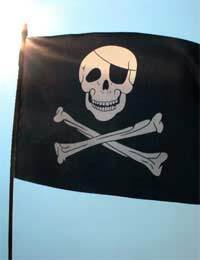 The mere sight of a black flag adorned with a skull and crossbones, waving defiantly in the wind on the green is enough to have most members reaching for a sand wedge and rushing to repel all boarders. Is this the symbol of invaders aiming to stake a claim to the course? Well, before anyone gets hot under the collar, a little explanation is called for. The sinister flag is the most visible symbol of a new competitive format that aims to bring a new dimension to the grand old game. How does it work? Well, the match takes place over a total of nine holes using the Stableford method, points attributed in relation to a player’s score against the par of an individual hole – for example, one over par, one point; par, two points; one under, three points – with the overall winner the one who accumulates the most points. The unique aspect of PowerPlay is the fact that every green has two flags: a standard one, and a PowerPlay, the aforementioned skull and crossbones that is located on the most difficult part of the green. In the first eight holes of the match, a player must take on three PowerPlays i.e. nominating to play from the tee to the skull and crossbones. If successful, they earn double points. On the final hole, the brave – or should that be reckless – can opt to take a bonus PowerPlay. The driving force behind PowerPlay is a belief that in today’s fast-paced world, many people just don’t have the time to devote to a sport that requires around three to four hours to complete 18 holes. In addition, bringing new blood into the sport means, unpalatable as it may seem to some, a more dynamic variation on the traditional format is required, in the same way that Twenty20 has broadened the appeal of cricket in recent years. Players interested in trying the new format out for size should visit www.powerplay-golf.com, where they will find a list of courses both in the UK and around the world that host matches. But not only are enthusiastic amateurs eager to try PowerPlay; the professional circuit, too, has shown itself open to new ideas: PGA members in a number of countries are competing in a world series championship that aims to publicise the new format. There is also a “shootout” version that has been designed to appeal to TV broadcasters, in the hope that coverage on the small screen can quickly bring PowerPlay acceptance in the wider golfing community. One only has to look at the way Twenty20 has been adopted by cricket fans to realise the promotional pull that television has. In no way is PowerPlay a threat to the game of golf, so don’t worry that the Open Championship or Augusta National is going to be marginalised. It is simply another form of competition, and can perhaps be viewed as providing an introduction to the skills of the game which can be taken on and later adapted to 18-hole stroke play or match play. The skull and crossbones should not viewed with fear or suspicion; rather it should be taken as a challenge, and let’s face it, all golfers love a challenge.